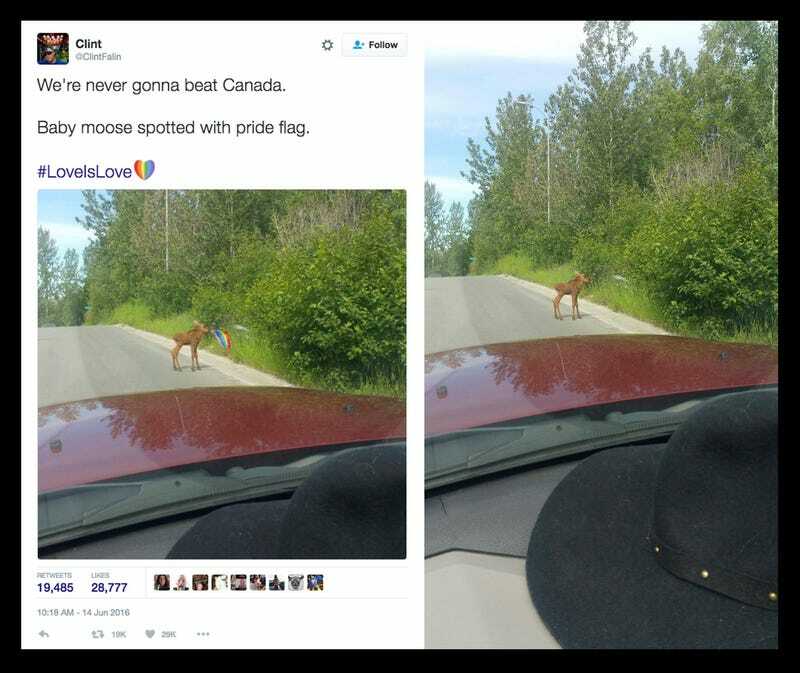 Have you seen that photo of a baby moose holding a gay pride flag? It’s adorable. But unfortunately, it’s also fake. Why is the internet so mean? The photo below has been doing the rounds lately with an astonishing number of retweets on Twitter. And probably an untold number of whatever the Canadian equivalent of a retweet is. I’m going to guess the Canadian word for retweet sounds like 10 per cent more French and is paid for by the government. But I digress. Craig Silverman over at Buzzfeed Canada spotted the fake and was the first to debunk it. Before Silverman became the editor of Buzzfeed Canada he was best known as the founder of Poynter’s Regret the Error blog, where he tracked mistakes in media. Silverman even talked with me once about Gizmodo’s debunking of viral photos. And he clearly hasn’t forgotten his debunking roots. Silverman, in true Canadian fashion, is apologetic about bursting everyone’s bubble. But the truth has to be told. Or not. You could’ve let us live with the lie. Thanks, Silverman.